Latex rubber glow in the dark Scream Ghostface Mask with hood. One size fits all. Slasher film Scream, released in 1996 went on to become one of the most successful horror franchises in film history. 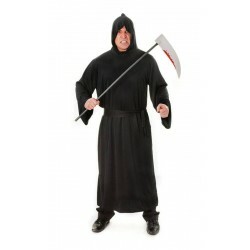 Complete the scary look of this iconic figure with our Scream Robe and Bloody Scream Knife.